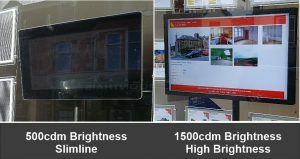 A4 Landscape LED light pocket property displays and a networked digital media screen property displays project, which can be controlled by our customer from anywhere by logging into our online software digital signage portal. 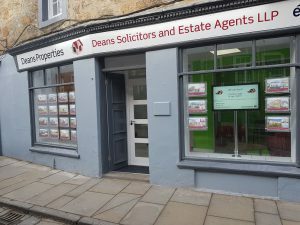 for our Edinburgh based customer in their recently refurbished South Queensferry office. The screen is suspended on a 50mm steel post which is mounted to the window bed. We also managed to conceal all electric transformers, cables, and connections, by working with the contractors and advising them of the requirements, and what we needed to do to hide all visible components. 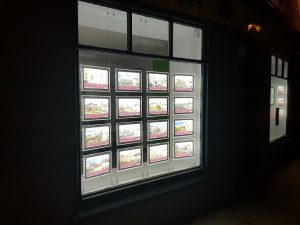 This window looks onto a busy main street in the picturesque village of South Queensferry, on the outskirts of Edinburgh, with busy through traffic, so the illuminated window display, and the moving pictures of our high brightness screen are great for highlighting the presence of our customer’s High Street office. 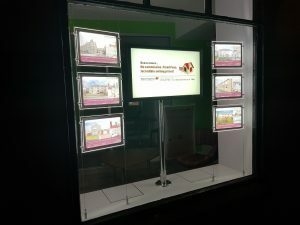 As our customer contacted us during the refurbishment of their office, we were able to work with the contractor’s joiners and electricians to ensure that all electrical components for the power supplies for the light pockets and digital screen could be discreetly concealed, while also being easily accessible for maintenance purposes in the future.